Did you know that you can make your home more energy efficient by installing the right windows? Your home’s windows actually contribute a lot to how well you save on energy costs and generally make your house a more comfortable place to live in. 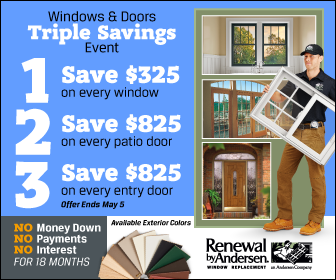 Renewal by Andersen® of St. Louis discusses how you can boost the energy efficiency of your home with their energy efficient windows. Before we go with the technical sides of our windows, did you know that the actual style or design of a window actually determines how energy efficient it is? There are some windows that are more energy efficient than others, which is why picking the right one is very important. A good example of an energy efficient window is our line of casement windows. This is the “classic” window style typical of traditional homes and it boasts a higher airtight seal than others. We highly recommend this window if you want to improve the energy efficiency of your living spaces. What makes our line of windows extremely energy efficient is the glass panes we use. Our windows boast High-Performance™ Low-E4® glass that has is specially coated with state of the art technology. Our glass actually has more layers than the st andard one, and what this does is let in more visible light than harmful light. The resulting benefits are twofold – you get the desirable daylight, which naturally lights up your rooms while reflecting the undesirable UV light. It’s energy efficiency at its finest. When we work with you, we make it a point to explain what each of these glass types do and what their long-term benefits are to your home. Give us a call at (314) 332-2364. We offer our window installation services to homeowners throughout St. Charles, MO and other parts of Missouri.